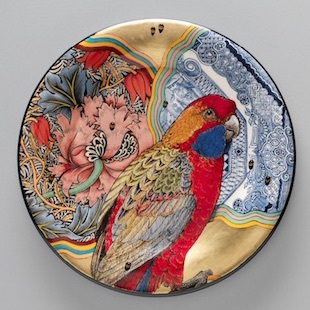 Australia has been referred to as ‘a land of parrots’; in these plates we catch a glimpse of this ornithological richness. The viewer is presented with birds as lively natural history specimens, set against the artificiality of ‘patterns’ that are themselves drawn from nature... They are usually admired for vibrant colours, beautiful plumage and their intelligence and engaging behaviour, which Bowers suggests so well, painting the eyes, beaks, claws and feathers in remarkable detail, emphasising their form, pattern and texture.